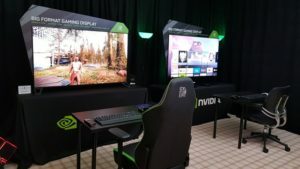 Nvidia has appealed to PC retailers to prioritise gamers over cryptocurrency miners. Nvidia has revealed its Titan V graphics card, which it says is the most powerful GPU ever created. GE Healthcare has announced it will use Nvidia’s deep learning platform to assist it in processing healthcare data. Nvidia recently launched its GeForce GTX 1070 Ti, which offers high-end performance. Nvidia’s GeForce GTX 1070 Ti is now available for pre-order in South Africa. Nvidia and AMD plan to release graphics cards designed specifically for cryptocurrency miners, according to a report from DigiTimes. EK has launched new water blocks for Nvidia’s GeForce GTX 1060, 1070, 1080, 1080 Ti, and Titan X graphics cards. Nvidia has launched Volta, “the world’s most powerful GPU computing architecture”. Nvidia has unveiled the GeForce GTX Titan Xp, which features the company’s Pascal architecture. These April Fools jokes could be amazing if they were real. Nvidia has unveiled the Jetson TX2, a credit card-sized platform for use in factory robots, commercial drones, and smart cameras. Nvidia revealed its top-of-the-line GeForce GTX 1080 Ti graphics card at GDC 2017. We compared a single graphics card from each architecture, focusing on GPUs of the same performance class. Here is every Nvidia GeForce GTX 10 Series graphics card you can get in your laptop. Here’s one page every PC gamer should have bookmarked. Nvidia recently revealed the DGX SaturnV, the most energy-efficient supercomputer ever created.